Tinder is the crucial middle link between a coal (such as that produced by a bow drill) and actual flames. 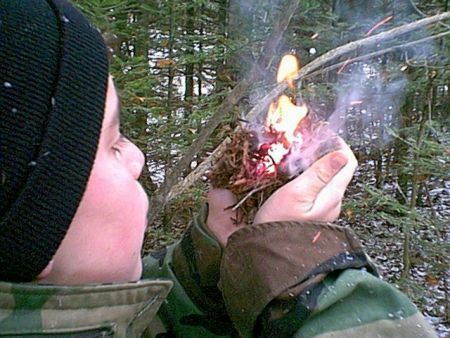 Tinder is made from materials that catch a spark readily, or to which a coal can be added, and which can then be blown into a flame to actually start a fire. Blowing a tinder bundle into flame. 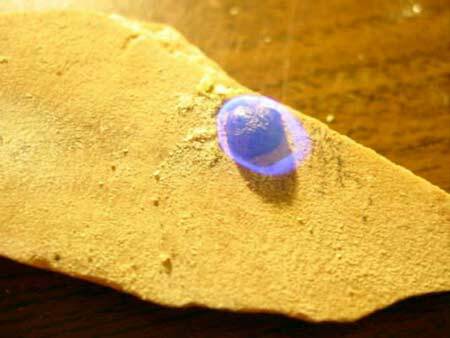 If you are fortunate enough to find some native sulfur, throw some sparks on it using percussion fire-making. It will light without any further assistance. Just don’t absent-mindedly inhale the fumes as I did!